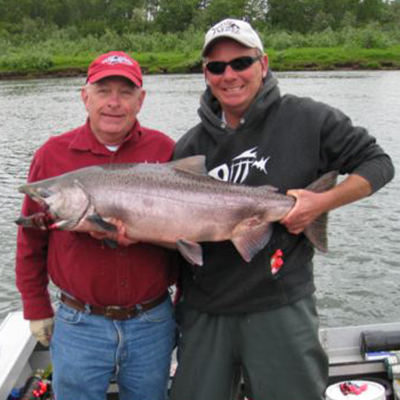 Best Alaska Salmon Lodge Guest Boats 40 Pound King! 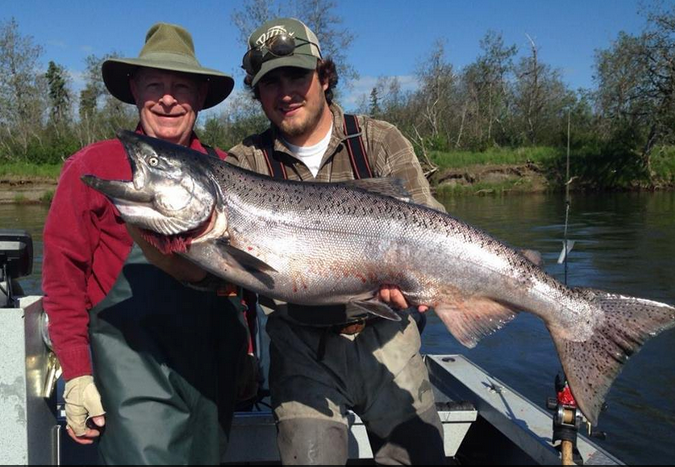 Another amazing season has started at the Nushagak River Fishing Lodge, considered to be the Best Alaska Salmon Lodge. 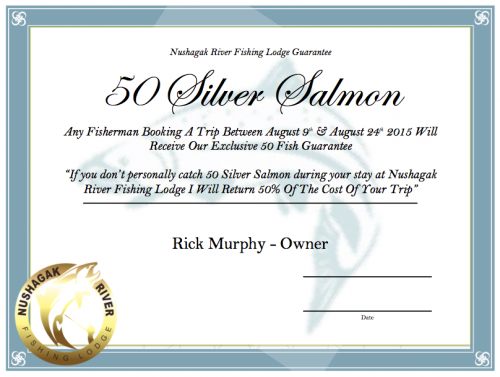 Nushagak River Fishing Lodge is one of the most amazing Alaska Salmon Fishing experiences that you will ever have. The famous Nushagak River located in Bristol Bay Alaska is the backdrop. 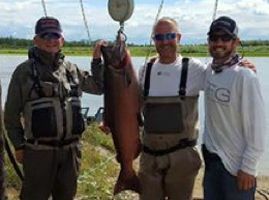 The Salmon Fishing in Alaskas Nushagak river is considered by many to be the best Alaska Salmon Fishing with millions of salmon returning each year to spawn. 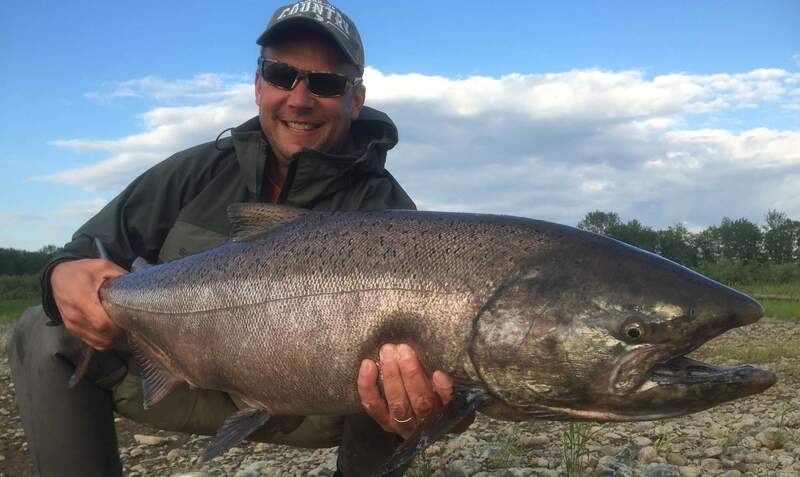 The Nushagak River Fishing Lodge offers world class King Salmon Fishing, Silver Salmon Fishing, Sockeye Salmon Fishing along with Chum, and Pink Salmon. It’s a Salmon fisherman’s paradise! Alaska Salmon Fishing at its Finest! 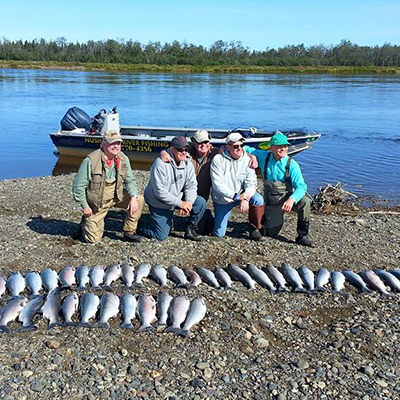 In addition to incredible Alaska Salmon Fishing the Nushagak River Fishing Lodge has an abundance of Rainbow Trout, Grayling, White Fish, and Northern Pike. We promise you that you will never run out of something to catch. If your considering coming to the Premier Alaska Salmon Fishing River in Alaska why would you consider staying anywhere else but the Nushagak River Fishing Lodge? 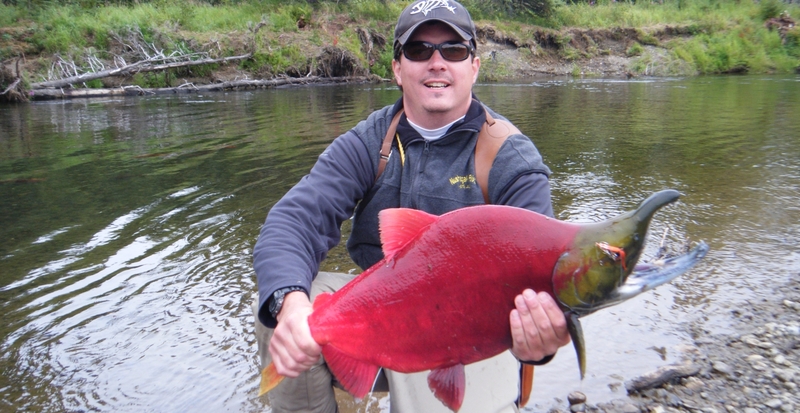 You will quickly see why it is the Best Alaska Salmon Fishing Lodge in the entire state. Feel free to call one of our references who have been to the lodge! If you want to experience some of the best Salmon fishing in the world, book a trip with the Nushagak River Fishing Lodge. The fishing, accommodations, staff, and guides are all top-notch and fine-tuned to provide you with a true trip of a lifetime. 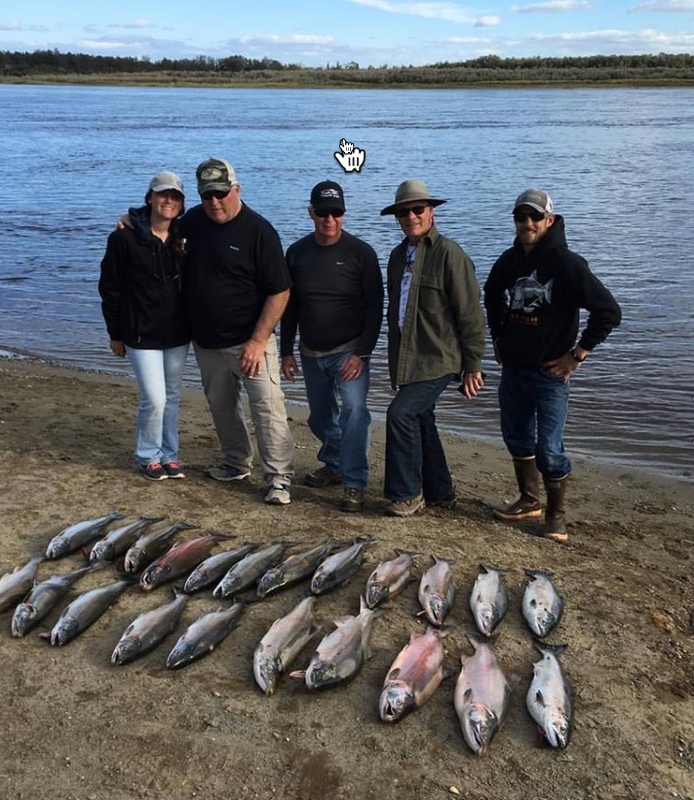 The lodge is located smack dab in the heart of the prime fishing area of the Nushagak River, one of the primary drainages to world famous Bristol Bay. Salmon use the Nushagak as a major gateway to their spawning areas. To say the Salmon fishing is excellent is an understatement! The fishing is incredible. The Salmon run this baby in droves, and thel odge is perfectly situated for catching them until your arms are sore and your heart content. The lodge is fly-in only access, keeping the area pristine and without the crowds experienced on other Alaskan Rivers during the Salmon run. Millions of salmon return from the ocean to the Nushagak every year to spawn, making this one of the hottest fishing spots in Alaska. In short, this is Salmon heaven. Rick Murphy is the owner/operator of the Lodge. He has seemingly boundless energy, and wonushagak sportsman newsrks hard to ensure that everything is in order and everyone’s needs are met. He is a local from Dillingham, a small town down-river where the Nushagak enlarges into Bristol Bay. A natural outdoorsman, Rick commercial fishes Bristol Bay for Sockeyes before the lodge opens each year, and hunts moose as soon as the last fisherman departs at the end of the season. He has earned the monikers “Salmon Slayer” and “Moose Slayer”. The locals respect his fishing and hunting prowess, and look up to him. He is active in community service and has started a ministry program to help locals with a food bank and counseling. Not short by any means on ambition, he has even tried his hand at national politics as a delegate to the national convention. He is serious about business, and prides himself on providing the highest levels of customer service for his guests, but is also a funny, amiable, all-around good guy. 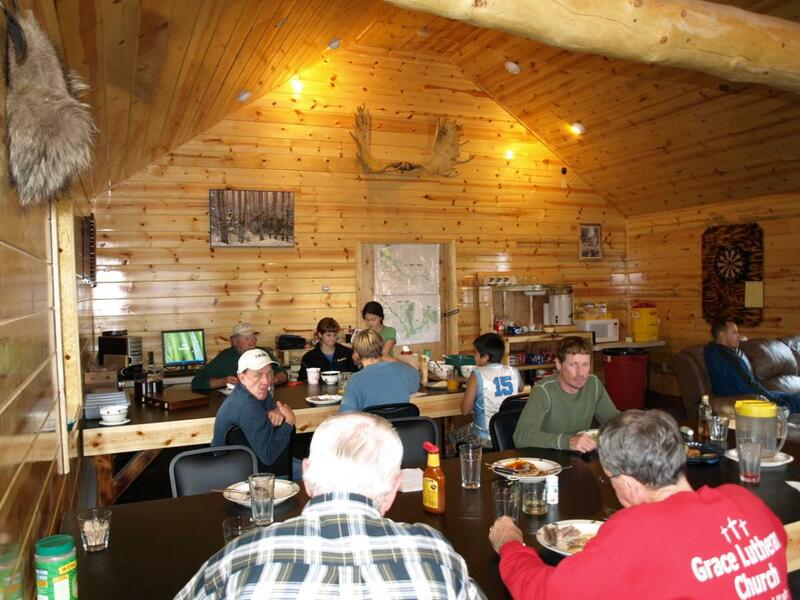 The lodge is situated right in the prime fishing area. You do not have to go on a long boat ride to get to the fishing spots. Some of the best holes are right across from the resort. We caught salmon from shore while cleaning the fish at the lodge! The resort is located on top of a beautiful flat bluff overlooking the river. The lodge opened in 1995 with one small building, and has evolved into a full service resort with all the amenities of home. Rick has developed the property for customers comfort, and takes great pains to ensure every guest is completely satisfied with their experience. The main lodge is where guests meet for breakfast, lunch, and dinner. There is a large flat screen television with satellite channels and comfortable couches. A small bookshelf is chock-full of some great books on Alaskan salmon fishing and the local Bristol Bay fishery. The guests usually unwind and tell of their fishing exploits after dinner, and an occasional friendly poker game is not unusual. Most cell phones will not work in this area without a special local chip and service provider. The lodge has Wi-Fi to allow some communication through text and emails, and there is a satellite phone for emergencies. The facilities. 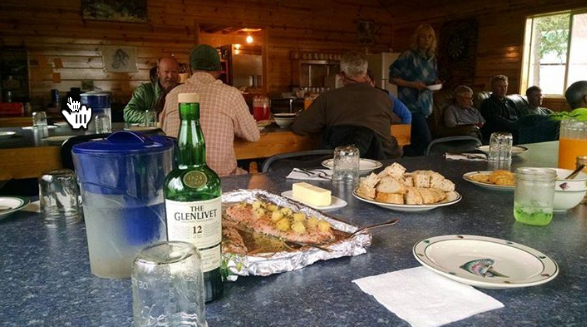 This is a real treat for a remote fly-in lodge. There is a bath house with 2 hot showers, and there are three regular lighted toilet stalls with flush toilets. This is a luxury for this type of “rustic experience” miles from any minor type of city. There are 3 cabins available for lodging. They are fully furnished with carpeted floors, heaters and AC power. They run the generators so there is power all night long. 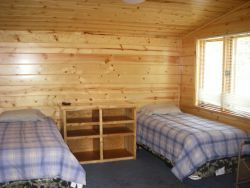 The Wi-Fi reaches the cabins and there is satellite TV in each unit. There is daily laundry service. There is a four-plex with 4 beds and kitchen facilities (with the chef they have you will not be needing this at all!). There is a comfortable duplex consisting of 2 units with 2 beds in each. The remaining cabin is known as the “honeymoon suite”, which affords the ultimate in privacy with its own bathroom and shower. The lodge houses 12 guests comfortably and it is this limited number of anglers that ensures a “once in a lifetime” type of fishing experience that you can come back to year after year. I want to get on with the fishing experience, but I would be remiss not to go into the dining experience that we enjoyed during our stay. Now I have stayed at many a fancy lodge, and many a rustic one too, and have had some mighty fine eats along the way. But the five days of exceptional meals, with individual attention and special requests honored, deserves some special accolades. Resident chef Nick Dennis brought his considerable culinary skills to the table with a incredible display of “Northwest Cuisine” inspired dishes. Utilizing fresh, local ingredients to conjure up some tasty offerings. Nick made sure that each guest received personal attention in their food preparation. All breakfasts were made to order, including pancakes, bacon, hash browns, toast, fresh fruit, cereal, oatmeal, or eggs any style. One breakfast specialty was his special smoked salmon hash, which was a home run around the dining hall. Some of his dinners included trip-tip steak, heavenly halibut, smoked pork ribs, rib-eye steak, chicken coq au vin, and of course fresh salmon in a silky teriyaki glaze. He will cook your salmon every night for you, as one guest wanted. I requested a little salmon sashimi and sushi combo. 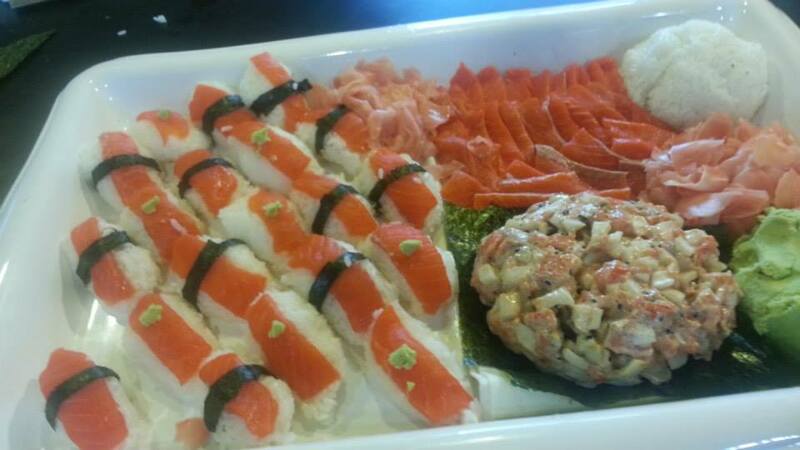 He made several large platters of delectable rolls and sashimi that would make a Japanese master proud. Nick accommodated all request without fail and with genuine pleasure. More than one guest commented that they were gaining weight during the trip. I can attest to eating more, and more often than I do at home. Delicious. I was accompanied on the trip by fellow outdoorsman and close family friend Terry Ferguson from Knoxville Tennessee. We had just returned from fishing rainbows and browns in the Roaring Fork Valley on the western slope of Colorado the month before, and we were wound up to battle some feisty Coho’s. I met Terry in the airport in Anchorage. We were spending the night there so we took a shuttle to the Puffin Inn to drop our gear. We grabbed a cab to downtown Anchorage to get a bite to eat and grab some souvenirs to take home. You must try the reindeer sausage from the street carts, the smell is intoxicating, and they are tasty. After a good nights’ rest, we hustled to Merrill Field for the short hour and a half flight to Ekwok, a small Yupik Eskimo village. The scenery over the glaciers and mountain crags is amazing, and I spotted a large moose as we flew overhead. We were met upon landing by Rick and his staff. They loaded our gear in the back of his truck and headed down to the river. Seven miles downstream by boat later we pulled up onto the bank. We were at the lodge. The river conditions looked great, man I wanted to wet a line post haste. We were given a tour of the property and shown to our room. After a hearty lunch, we donned our waders, grabbed our gear and headed down to the boats. well organized. Unless you have a special rod and reel you can’t live without, there is no need to take any tackle whatsoever. 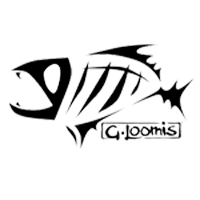 They have an assortment of G Loomis or Reddington spinning and fly rods, outfitted with either Shimano or Pfleuger reels. Our guide motored us across the river and anchored in the current near the far bank in about 4 feet of water with the lodge as our backdrop in this pristine setting. The trusty salmon egg loop rig loaded with cured salmon is the most common method used, so we baited up and got to it. We bounced the eggs off the bottom and were immediately hit. I missed the first fish, but with new bait, slammed the next one. Man these Silvers can fight. After several screaming runs, a nice 9 pound “chromer” was in the net. This fish was fresh from the ocean and still sported sea lice. Terry and I were fishing together and the action was just non-stop. We caught and released fish after fish. Double hooks ups were the norm rather than the exception. Just unbelievable. We boated 56 fish in just under 3 hours of fishing, and we were just getting the hang of it on the first afternoon! It isn’t unusual to catch 25 to even 100 fish a day, there are crazy numbers of fish coming up-river. The limit on Silvers is 5 a day, so we only kept the fish that were bleeding and would die if returned to the river. We routinely caught fish in the 6 to 12 pound range. The largest fish we caught was a touch over 13 pounds. They are not huge Coho, but man are they abundant. We also caught the occasional Dolly Varden and White fish. Every day we caught as many fish as we wanted. To change it up a bit we went upstream to a sand bar where a tributary enters the “Nush”. We pulled the boat on shore, switched to spinners and flies, and caught more salmon as well as Graylin and Rainbows. It was great to get out, wade in, and fight it out with them with your feet in the river. The guides are some of the best in the business. 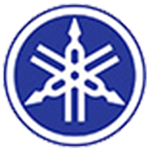 They are extremely knowledgeable and highly competent. 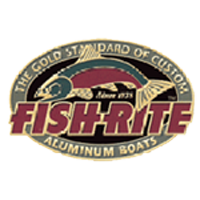 They run their boats super efficiently, including baiting the hooks and netting your fish. Quite a chore when fishing 4 anglers to a boat often with triple and quadruple hook-ups! The fish you decide to keep are bled immediately to improve the meat quality. They expertly fillet them when you return to the lodge, then vacuum sealand freeze the filets, or offer to cook up a fresh fillet for your dinner. They package your frozen fillets in 50 lb. fish boxes for transport home the day you begrudgingly have to leave. People have a hard time believing how great the run is on the Nushagak, because the amount of fish caught in any given day, or over the 5 days is just incredible. I have had some great days on the Kenai, but have never experienced anything like this. It is truly a remarkable fishery. The trips are 5 days and Kings are targeted from June 15th until July 20th. 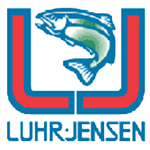 The Silver or Coho salmon are fished from July 20th to September 9th. Rick can be reached at 866-770-4386, his cell at 907-843-1081, or e-mail at salmonslayer77@gmail.com. The website has some great information and pictures www.nushagakriverfishinglodge.com. I interviewed most of the guests and one thing they had in common was satisfaction with all aspects of their stay. One of the anglers has come every year for the past 16 years! Another father and son team was on their 6th visit to the lodge. All three of them said they would be back next year. Rick is a hands-on owner who prides himself on providing the highest levels of service to his guests. The staff is friendly and will bend over backward to meet your requests. If a comfortable lodge and some of the best fishing on the planet is your idea of a great vacation, book a trip as soon as you can with Rick. You must experience it firsthand to appreciate the experience of a full on salmon run. This place is freaking OFF THE HOOK! Once at the Lodge pretty much everything is included. We clean and package all your fish for you to take back.